It may start as a desire to do more. A desire to share your medical skills. You feel blessed and know that you can be a blessing for others who lack access to health care. 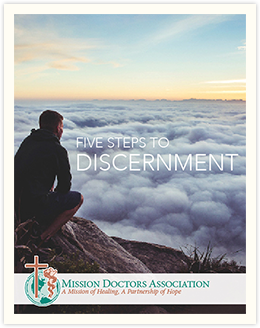 Mission Doctors Association stands in the unique role of being the only organization exclusively dedicated to recruiting, sending and supporting Catholic Doctors to serve at Catholic mission hospitals and clinics in response to requests from Bishops and Religious orders who run them. In addition to the original three-year, long-term service program, Mission Doctors offers a short-term option for doctors and their families feeling called to serve one to three months. Most who do so, work alongside long-term Mission doctors or at facilities where MDA has a long-term relationship. Patients in Belize, Peru, Uganda, Tanzania, and Ecuador need your skills, your compassion and your expertise. The first step is to submit an application then attend a weekend Retreat/Seminar where you will have the opportunity to reflect on this opportunity to serve, both in light of our Catholic faith and the practical issues of visas, licenses, insurance etc. You will hear from other physicians and dentists who have responded to the call. Currently scheduled twice yearly, the weekends feature returned mission doctors who share their firsthand experience, presentations about specific locations and illness commonly treated at these locations. Questions on how spouses and children can become involved are also covered. The weekend also provides a space to spend time reflecting on God’s call to “heal the sick” and your own desire to serve. 8:30 Good Intentions Bad Outcomes – Where do we go From Here? Mission Doctors Association is the only organization exclusively dedicated to recruiting, sending and supporting Catholic Doctors to serve at Catholic mission hospitals and clinics in response to requests from Bishops and Religious orders who run them. Describe the causes of illness and death specific to resource-limited mission countries. -State factors common to most mission countries which have an impact on how medical care is delivered. Discuss the effect of culture on life and work in mission countries. -Define stereotyping as it relates to both how the physician interacts with patients in mission countries and how those patients may have preconceived ideas about him/her. -Be able to approach patients in Missions with an understanding and respect of local cultures. -Have an improved appreciation of patients’ understanding of their illnesses and related treatments. Discuss the Catholic understanding of mission and social justice. -State the basics of how the Catholic Church concept of mission relates to the work of the laity. -State the basics of the Catholic Church theology of social justice. -Know recommended resources to progress in this spiritual journey further. This educational conference will address the following competencies: Patient care, interpersonal and communications skills, interdisciplinary team skills, and professionalism. Loyola University Chicago Stritch School of Medicine ensures balance, independence, objectivity and scientific rigor in all educational activities for which CME credit is awarded. Complete disclosure information will be provided to the audience in the printed activity materials. This activity has been planned and implemented in accordance with the Essentials Areas and Policies of the Accreditation Council for Continuing Medical Education (ACCME) through the joint providership of Loyola University Chicago Stritch School of Medicine and Mission Doctors Association. The Loyola University Chicago Stritch School of Medicine is accredited by the ACCME to provide continuing medical education for physicians. The Loyola University Chicago Stritch School of Medicine designates this live activity for a maximum of 11 AMA PRA Category 1 Credit(s) ™. Physicians should claim only the credit commensurate with the extent of their participation in the activity.